Published May 4, 2018 at 5:20 p.m.
Milwaukee is known for its brewing history, fine cheeses, Harley-Davidson cycles, Summerfest, the Fonz, Jeffrey Dahmer (boo), the Brewers' sausage race and its proximity to quite possibly the greatest of the Great Lakes. But during a conversation earlier this week, Caroline Rubitsky, owner of Caroline's in Walker's Point, reminded us that Milwaukee, in some circles, is also revered for jazz music and jazz musicians like Al Jarreau, Manty Ellis, Berkeley Fudge and many more, both passed away and very much alive. "I think it's just a lucky accident that so many jazz musicians were born and grew up here," says Rubitsky. 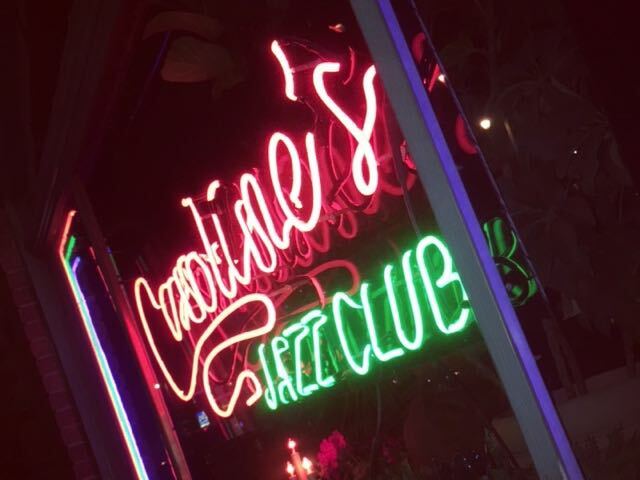 Most of the jazz clubs in the Bronzeville neighborhood that were hopping in the 1940s and 1950s have closed, leaving Caroline's one of only a few jazz clubs left in the city. But Rubitsky says she has noticed a strong revival of the genre, particularly in the past three years. "I thought jazz would die with all of us older people, but there's been a huge resurgence of interest from younger people," says Rubitsky. 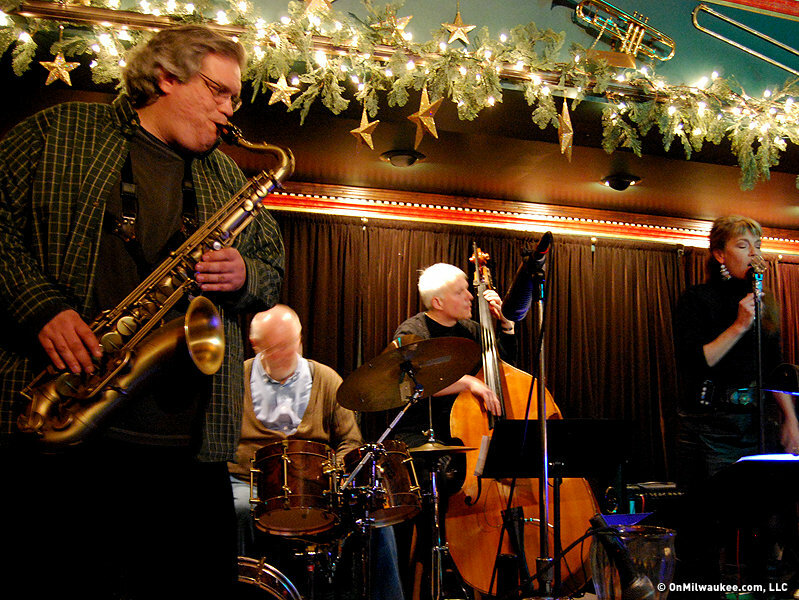 "I just delight in saying this because they pass it on through social media and that proliferates it even more and makes (the jazz scene) very fun and exciting and interesting again." "Milwaukee has a very deep pool of local musicians and jazz education programs and I like to tap into that," says Rubitsky. 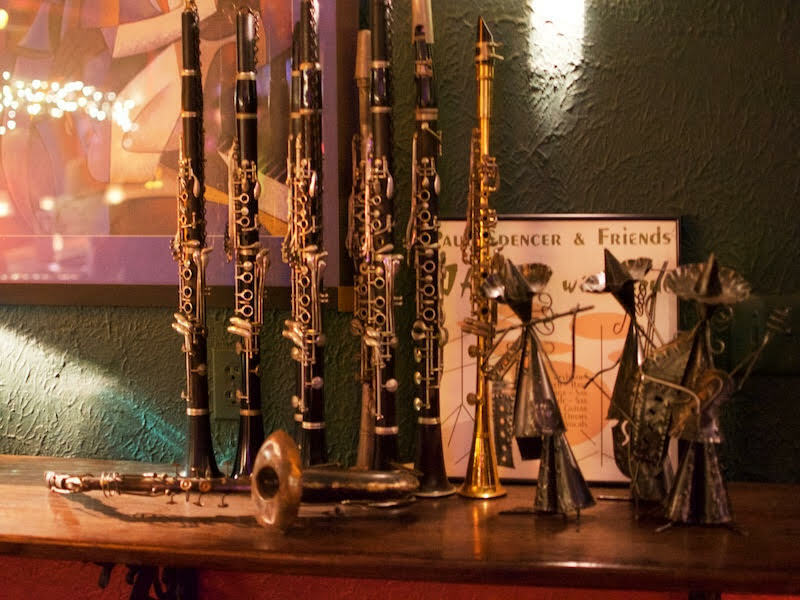 "We have a lot of older musicians who traveled and became internationally renowned and moved back to Milwaukee as well as many extremely talented high school and college-aged musicians." 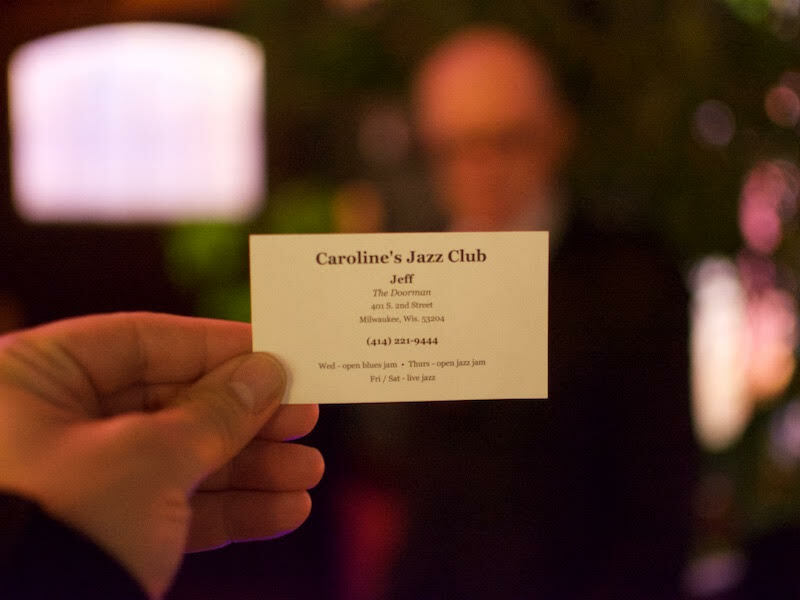 Although jazz is at the heart of this corner club, a visit to Caroline's – located inside a building erected in 1880 – offers more than music. The dimly-lit space is a step back in time – and yet ignites the moment – with crown molding, stained glass windows, floral green carpeting, thick maroon curtains framing the small stage, tables for two topped with candles and instruments hanging from the walls and ceilings as sculpture. 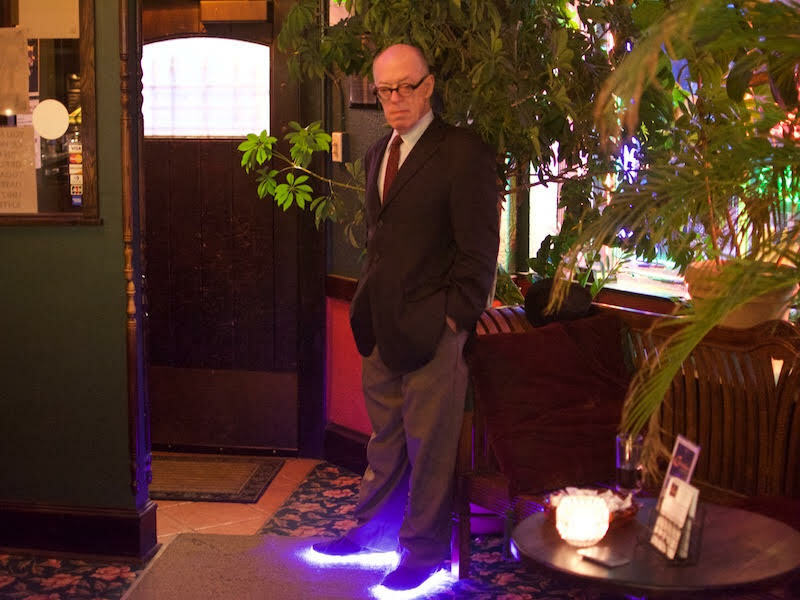 The 365-degree bar features dapper bartenders – there's also a very dapper doorman with LED light-up shoes and business cards – and like many old-school joints, there isn't a drink menu. "All of our drinks are hand-crafted – no mixes," says Rubitsky. "Martinis, old fashioneds, Polynesian drinks, herbal-infused drinks, side cars, rusty nails, Tom Collins – just about anything you want we're game for." Caroline's also has a solid selection of beer, including local products from Milwaukee Brewing Company, Lakefront, Good City and more. "And of course we have Miller and Bud products," says Rubitsky. Rubitsky says her business is doing extremely well, in part because the Walker's Point neighborhood is growing so quickly. "When I opened 18 years ago, it was still a pretty quiet area with abandoned factories and warehouses," says Rubitsky. "Now it's booming and has become a neighborhood where people can walk from place to place and enjoy great restaurants, bars, venues and art galleries. It's amazing." Caroline's customers are a mix of people from Milwaukee as well as all over the country. It has a diverse clientele and therefore makes the short-list of Milwaukee establishments that attract more than one race of people on a regular basis. Once again, music unites people. "I can't say enough about Milwaukee's music talent. There is a great amount of it and it really makes me happy to see people appreciate it," Rubitsky says. "We draw a lot of people locally, but also people from Chicago in increasing numbers and tourists from all over the world staying in the hotels. I love that."